Mr. Hu Jining, Mr. Peng Dening, and I visited Tian Hu school students on Saturday, June 1. This is an immigration district with about 5000 residence. They immigrated from a rural area destroyed by new resovior (about 10 years ago). 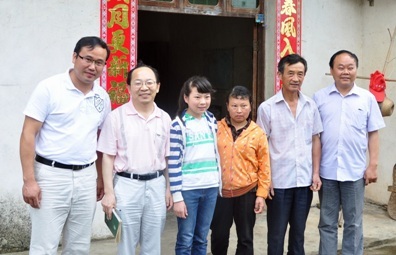 I have now visited all school district in Ningguo at least once. I learned a lot from these visits about the poor kids and the area and have been inspired and moved by them and their familes. Zikang and Zihao Zhang are twin brothers. They are both 8th graders. They live with their grandparents, parents, and older sister in 12th grade. His grandma is sick and can not get up anymore. His father is a carpenter and his mom cooks for a local company. They both like math and sports. 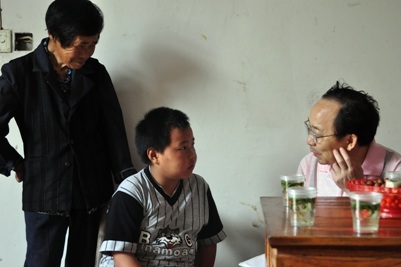 Benlin Liu is a 4th grader born in 2002. He lives with his aged grandma (81) and his father. His mother left when he was 7. His father is a carpenter. He is really good at sports and has won a lot of awards, believe it or not. He also likes reading and math. Yuting He is a 2nd grader born in 2004. She is really cute and likes to talk and lead. She leads us to her home and starts to answer all my questions clearly and happily. She likes math, dance, and sports. Her mom is a little handicapped but manageed to find a job very recently. Her father also works so hopefully their lives will get much better soon and don't need our support anymore. She gets up before 6:30 and takes bus at 6:30am to school. It takes about 30 minutes (and 600 yuan a semester). The school starts at 7:40am. She has to leave early since the bus has to take students from other places after dropping her and her classmates in school. 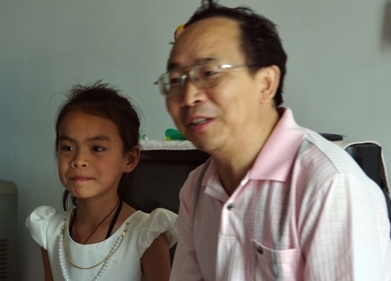 Yang Hong is a 2nd grader born in 2004. Although he lives very close to Yuting He (above), he has quite the opposite personality. He is very shy and either does not know or does not want to answer some of my basic questions. I feel that his mom leaving them did have an effect on him (he never saw his mom again after she left although she lives in a nearby city). He lives with his grandparents and his father. 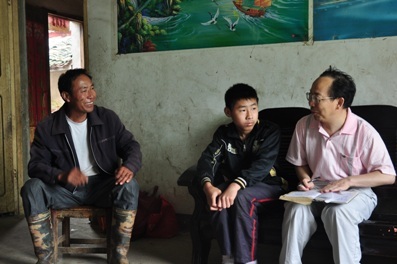 His father makes a living by fixing telephone and telephone lines (sometimes does not have work or pay). He likes math and sports. Yuxian Hong isa 8th grader born in 1998. She lives with her parents and older sister in college. Both her parents work at a local paper mill. Her mother's left ard was injured before and seemed also to be a little retarded. She likes sports and running and is not very good at math. She stays in school during the week. In the weekend and during winter/summer break, she helps her mom at the paper mill when she has time.